Have I mentioned how much I love DCC RPG? So does everyone else, I know. But It's not often--read "ever"--I drop nigh on forty bones for a single gaming implement. Nor do I usually consider textbook-sized rulebooks as a viable option. 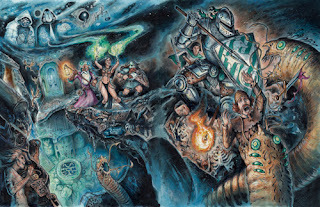 But for DCC RPG, I tossed aside my reservations and have absolutely no regrets; this game fawking rawks. Some aspects of this game are so in sync with my own gaming preferences that I can't help but suspect that the DCC dudes somehow peered directly into my brain when they were writing this sucker. The magic system is nearly perfect, the experience system is perfect, alignment and clerics aren't quite perfect but they're much closer than anything I've ever seen before. Indeed, between the scenes of mayhem depicted in the artwork--Doug Kovacs work in particular--the reliance on odd-shaped dice--even by D&D standards--and the intricately developed spell system, you really feel that chaos is a malign presence in this game. As with any rules set, there are a few things I'm not thrilled about, but my complaints regading DCC RPG are so minor that they can be dismissed as the niglings of a self absorbed jackass. For instance, despite purporting inspiration from Appendix N, the rules often stress adherence to a strictly interpreted medieval campaign setting including widespread illiteracy, prevalence of a non-monetary economy, extreme provincialism etc. All well and good, but not many of the Appendix N books I've read actually adhere all that closely to historically correct medieval, economic, or social structures. The same goes for the much vaunted character funnel. Where are the examples in the Appendix N body of literature--or any body of literature for that matter--of groups of 15+ unequipped, unskilled, foolhardy peasants throwing their lives away in Quixotic pursuit of subterranean adventure? It may--or may very well not--be a neat idea for a game, but, either way, I don't see that it follows with their purported mission statement. But all that minor BS is easily swept aside by all the goodies packed into this hefty tome. Random tables galore, rules for spell dueling, an XP system to end all XPs... but best of all: did I mention the Sample Dungeons? That's right; not one but two complete m***er f***ing sample dungeons; one for 0-level characters and one for 5th level characters. Phew! I'm in ecstasy here. DCC RPG has put the O in OSR. I hope it was as good for them.